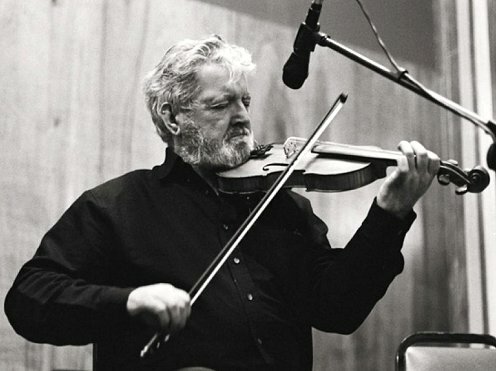 Tommy Peoples, who has died a few weeks short of his 70th birthday was without doubt the most inspirational and creative fiddle player of his generation. His was a style rooted in his native Donegal but coloured by his time in Dublin and Clare and shaped by his creative mind. His music was unmistakeable and characterised by the way he seemed to deconstruct and rebuild a tune to make it his own. His creativity was matched by an extraordinary technique on the fiddle , the freedom to play in any key or position on the fiddle and his unique trebles and triplets, percussive and rhythmical at the same time. Born into a musical family in Donegal, Tommy started on the fiddle at the age of seven under the instruction of his older cousin Joe Cassidy. He was academically able enough to win a scholarship to St Eunan's College in Letterkenny where he went as a boarder. The pull of the music was stronger than the books and he soon found himself in Dublin where, as he didn't have a fiddle at the time, he chanced into a shop to buy a tin a whistle. The shop was run by John Kelly who put Tommy in touch with the Dublin music scene. Tommy caused a sensation with his original fiddle style, played fast and fierce. His contemporaries in Dublin included Matt Molloy, Liam O'Flynn, Mary Bergin and Sean and James Keane. To stand out among those players he must have already been quite something! Around this time he formed his own ceili band The Green Linnet, and joined the Gardai and was posted to Bray. His inability to make any arrests led to him parting company with the Gardai fairly quickly and he moved to Clare where he married Maria Linnane, daughter of Kitty Linnane of the Kilfenora Ceili band. Tommy joined the ceili band and recorded with them in 1973. In the early 70s, demand for him to play meant he based himself in Dublin for extended periods. A Comhaltas LP released in the mid 70s captured the excitement in Tommy's playing is sessions recorded between late 1974 and early 1976. He played regularly with musicians who would soon become the Bothy Band and Tommy played on their first LP in 1975 and made a record of duets with Matt Molloy on flute. A dislike of touring meant he left the Bothy Band and went back to Clare where he spent most of his time working locally and playing local sessions. He recorded a few solo LPs for Shanachie and other labels through the 1980s. I first saw Tommy play in a folk club in London, probably in the early 1980s, where for the first half of the concert he never said a word, simply tuned his fiddle and played. For the second half he was joined by fellow Donegal fiddler Danny Meehan and the two men knocked out some of the most exciting music I had ever witnessed. We met Tommy in the mid 1990s at one of the local sessions in Kilfenora and were invited to join in at sessions in Linnane's and Vaughan's in Kilfenora and the Roadside in Lisdoonvarna. He was always sure to include us in selecting the sets of tunes and introduced us to any new company. He also showed himself to be an incredibly sensitive and creative accompanist to the occasional song. Outwardly he was a very shy and private man who let his music speak on his behalf. In private, after the tunes were finished, he was interested in people and was happy to hold extended, almost conspiratorial, conversations whether it was about family, acquaintances in common, or sport, especially hurling. He once held up the traffic in O'Connell Street, Ennis, to exchange news as he drove past us walking down the street. In these times he only drank orange squash; his drinking days were behind him and you got the feeling that the drink had helped him overcome nerves when he was in demand to perform. During the late 1990s he recorded The Quiet Glen CD at his home with Alph Duggan on guitar. For many, this was Tommy's finest hour. Crammed with his own compositions, the playing showed his creativity at a slightly more relaxed pace and in a more comfortable setting than any of his previous records. In 1998 Tommy was awarded the Musician of the Year by TG4 in the newly established Gradam Ceoil. Shortly after this he left Clare and moved to live in America, returning early in the new millennium to settle in his home place in St Johnston. He had once confided to us that he had always wanted to go back to Donegal and however much he loved Clare and its people, Donegal was home for him. For the past few years Tommy had suffered from emphysema was not able to play as much as he or his friends and admirers would have liked. In 2013 TG4 recognised him as composer of the year, making him the only person to receive two Gradam Ceoil awards. In 2015, Tommy published a book of his compositions which included a detailed analysis of his own playing style and approach to music in the form of a tutor for fiddle. As he said himself, he renovated and redecorated the tunes to make something new. He continued to the end to attend Scoil Samhraidh Willie Clancy, where he had previously been on the roster of fiddle tutors. He also supported the Micilin Conlon commemoration weekend in Lisdoonvarna in October. He was celebrated at the last Scoil Samhraidh Willie Clancy in a tribute hosted by his friend Paddy Glackin only three weeks before he died. Tommy's fiddle playing was unique. Caoibhin MacAoidh in his book on Donegal fiddlers noted that the creative musical genius Tommie Potts felt the person he had the greatest musical kinship with was Tommy Peoples. Most of Tommy's recordings and his book have been reviewed over the years in Musical Traditions. He has left a legacy on record and film that will endure. Tommy was the embodiment of the music maker, the dreamer of dreams. We were privileged to know him and play music with him. We will never see his like again. Our condolences go to his family, children and grandchildren. His funeral took place at Ennis Cathedral on Tuesday 7th August and was attended by musical colleagues and admirers saying their final farewells to a very humble musical genius.